I am bereft. No more Sam Vimes. No more Granny Weatherwax. No more Nanny Ogg. I could go on with a very long list, but I’ll stop. 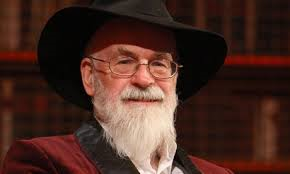 I feel genuinely diminished by the death of Terry Pratchett. He wrote about racism, slavery, war, religious intolerance and, of course, dwarves. He created some of the most human and humane characters in fiction – even though they might be werewolves or witches. And while many people might have thought of creating the God of hangovers, only Terry Pratchett could have come up with the Oh God of hangovers. I doff my imaginary hat to him and sing the Hedgehog Song in his memory, and I trust that he and Death are having a very interesting conversation – in upper case, of course. « Scottish Children’s Book Awards – The Results!